A follow-up to Color TV-Game 6 with an improved processor, allowing for 15 variations on Light Tennis. This time the games included two variants of Tennis, Hockey and Volleyball, and two Ping Pong games, all available to play in singles or doubles. Each variant features changes to the layout of the play area and the obstacles in the way of the ball. The final game is a "penalty shootout" where the aim is to fire the ball past a constantly scrolling target. 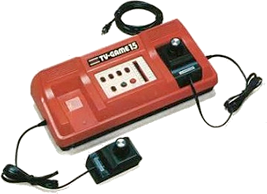 The only other major change to the game are the paddle controls, which are no longer part of the base unit, but attached to it by two wired controllers that can be stored in the system.